Fitness zone features side entry steps with sculpted massage seat, open barrier-free fitness area, and patent pending dual prop propulsion. Hot tub zone is a full featured 5 deep seat spa. Separate zones with filtration, heating, therapy and fitness action controls. patent pending dual prop propulsion fitness stream for the widest, smoothest most balanced workout in the industry. 37 hydrotherapy stainless Reflections Jets™ for shoulder, upper and lower back, and calf hydrotherapy. 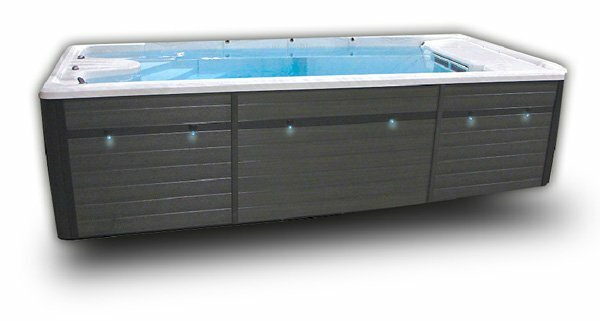 The dual zone TSX219 is the ultimate of aquatic fitness and warm water relaxation. Any season, any way you choose, there is plenty of space for the entire family in the 5 seat hot tub plus 102” of fitness area. You choose what best suits your lifestyle; enjoy both zones together or each separately. Hot tub in the winter, fitness in the summer or both all the time! Choosing the TSX219 is the solution to backyard fun and a healthier lifestyle.